The KTM dealer rolled out the gleaming white KTM 1290 Adventure on a clear crisp sunny morning in Cologne, Germany. I knew this ride was going to be one to remember. 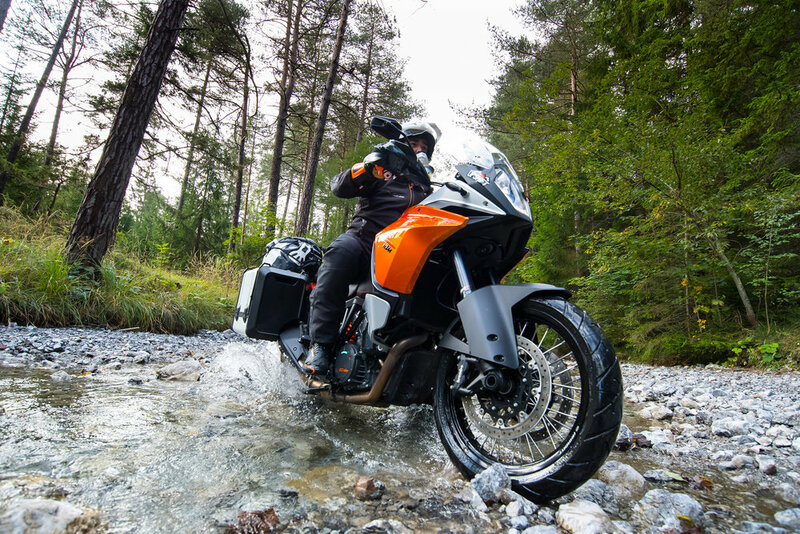 Just one day earlier I had been walking the halls of the giant Intermot motorcycle show in Cologne, and saw the unveiling of the new 2017 1290 Adventure R, 1290 Adventure T and the all new 1090 Adventure R. KTM’s uber cool media guy Rik van Gerwin had planned our route south. 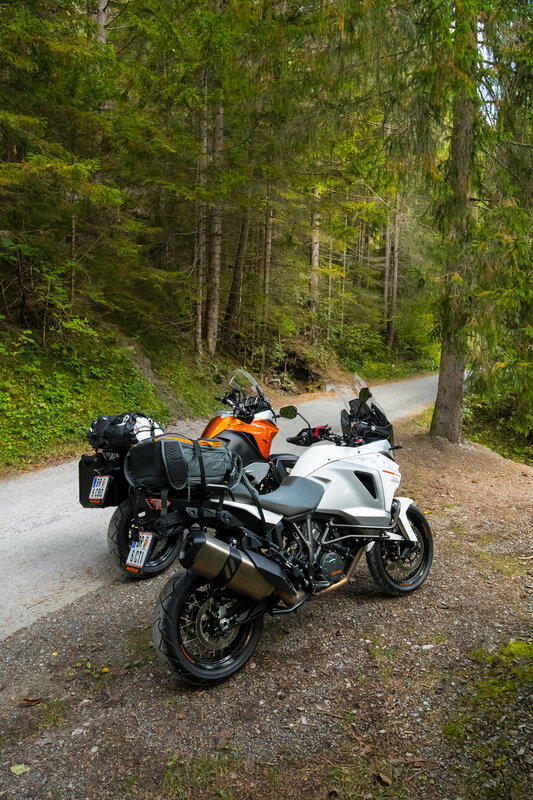 On the first day it would be about 600km of fast German Autobahn, then on day two into the Austrian Alps all the way through to the KTM mother-ship in Mattighofen, Austria. As we pulled out of the dealer parking lot, we were almost immediately merging onto a major highway. The 1290 has smaller wheels than my 1190 Adventure R back home in California. Added to that it had street tires, so initial feel of the bike was different for me and took some getting used to. Right away we were up to 135kph in the middle lane between giant trucks in the slow lane doing 80kph, and a never-ending stream of Mercedes, BMW, and Audi wagons in the fast lane probably doing 170kph. And then it happened. A Maserati blew by us measurably faster than the other asshaulers and now I was dealing with not just turbulence on the right from the trucks we passed, but now turbulence from the left. I now had Der Autobahn Armpump. After the first 200km we pulled over for some gas and a Red Bull. As we pulled back onto the on-ramp, the blood had re-entered my arms and I felt much more comfortable on the bike, and with the sheer pace of German freeway driving. The hours passed and I entertained myself looking at some of the town names on the exit signs. 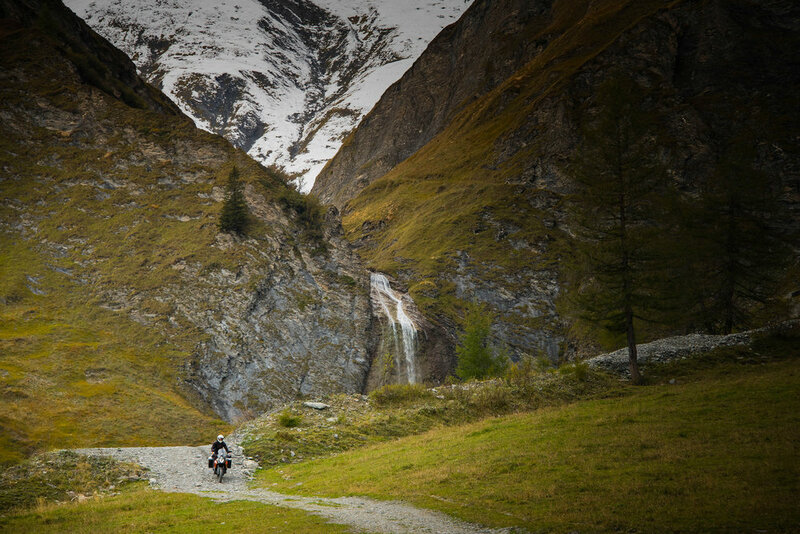 One day I hope to return and explore such places as Bad Boll, Frickenhausen, and Nesselwang. At around 5pm we passed through a long tunnel into Austria and pulled over to get our Vignette passes that allowed us on the Austrian roads. Light was fading as we entered the foothills of the Alps behind a line of cars and several large big rigs. I don’t know how the trucks stayed on the two-lane road through countless switchbacks. The cars right behind the rigs were getting impatient and a white Range Rover pulled the pin and sent himself into oncoming traffic and passed about eight cars and two rigs on a blind right hand sweeper. It was almost dark as we pulled over from behind the traffic into a scene out of an Austrian travel brochure. The Hotel Schloss Fersteinsee was a whopping 55 Euros (about $65) for a room, and it seemed too good to be true. Dinner and a few beers later it was lights out. In the morning as I was loading up my camera bag on to the 1290, I kept hearing a relentless ringing. I walked down the trail and found the source of the noise. Cowbells. These cowbells were attached to some really good looking super model cows, complete with the big eyes and the fake eyelashes. Rik found a small dirt road that headed up to a Schloss above our hotel. Evidently King Ludwig had summer vacationed here in the 1800’s. I could tell why. On the bikes again I knew today’s route would be a treat. I wasn’t disappointed, some real “Sound Of Music” stuff. Winding through each small village, I started to see signs for all the ski villages where the World Cup Ski races were held that I used to watch on the telly as a kid in England. Garmisch, Kitzbuhel, and even Innsbruck, home of the 1976 Winter Olympics. Moving off the valley floor we took the road to the Hintertux Glacier area. 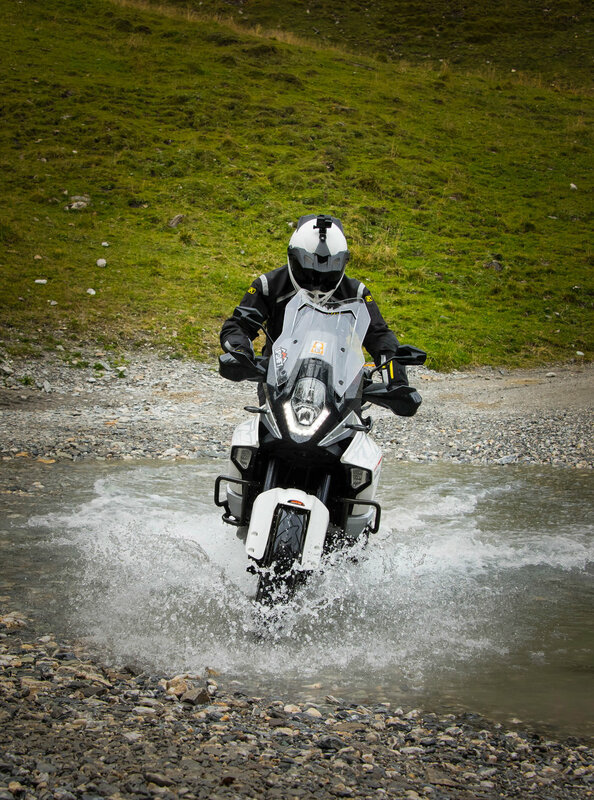 Once again my lack of road experience showed as Rik took off like a MotoGP rider on his 1190 Adventure. I think I was even holding up a local driver in a small minivan. Oh well, I was having a great time looking at the snow capped peaks and the quaint wooden houses as we passed through the small villages on our ride up the mountain pass. It was time to get off the road and find some dirt to snap some photos. We found a wide, smooth dirt road on the side of the valley and headed up to explore. The view was amazing, and we even found a stream crossing to get some action shots. On my first attempt to cross the water, my foot slipped off the peg, so I just grabbed a handful of throttle and got lucky with a smooth line through the submerged rocks. The bikes handled great on the dirt even with the more street oriented touring wheels and tire set up. By mid-afternoon it was time to go back down the same windy road and find the freeway to Salzburg, then onto Mattighofen. Rik was using his SatNav to great effect, even though he didn’t have the right mount. It was nothing that a roll of duct tape couldn’t fix! Back on the freeway we did 200km at a rapid pace, but as the sun was getting lower, the temperature dropped again. I had my heated grips turned up to eleven, and my Klim Badlands kit with some layers underneath, complete with balaclava. This wasn’t like riding in Mexico! We pulled into another postcard hotel about 15km from the home base of KTM in Mattighofen, and went to the bar for a beer and some really great food. In the morning the rain was coming down at a good rate as we rode the small distance through the villages to KTM. It was the only rain on our entire 1100km trip. I later found out that our route was the only dry area for the previous few days. I’ll be back to Austria one day, as I know there are hundreds of more roads in the region to explore. 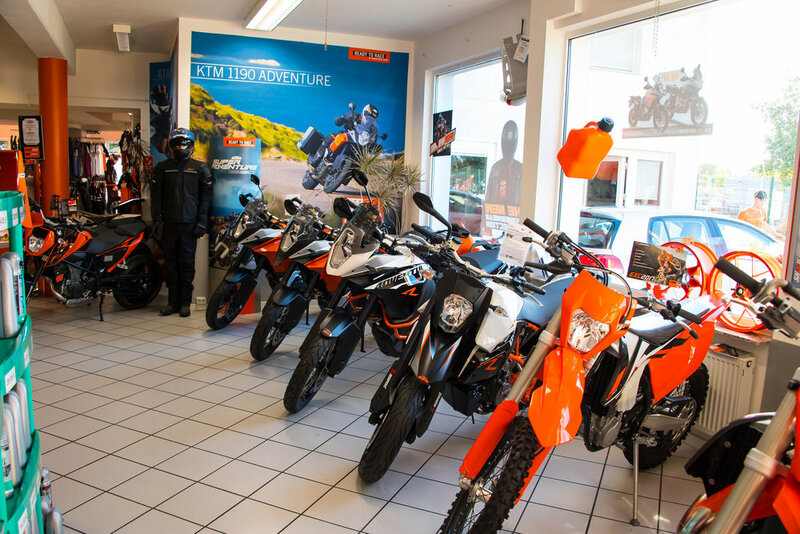 “Super danke” to Justin at KTM USA, and Thomas and Justine at the Austrian KTM HQ for their hospitality. Not forgetting “Der Trailboss” Rik van Gerwin for waiting for me on the fast windy bits!